Rebel has launched a service called Rebel Lite API, a stand-alone API to allow developers to build complicated emails using JSON. The firm, which had already provided an API to help clients utilize JSON and avoid HTML, reacted to requests by clients to use the same workflow for non-interactive emails, the company said in a blog post. Rebel clients need to send JSON, and they will receive HTML emails that function across all major email clients, it says. Users will receive up-to-date code, without a need for teams to maintain code, it adds. In addition, emails built with Lite API are mobile-responsive across all clients, the firm says. “There are a huge number of email clients in the world which are updated regularly, but rarely with any form of beta version or release notes,” the blog continues. Changing course, AT&T has decided against asking the Supreme Court to strip the Federal Trade Commission of authority over broadband providers, the telecom said in court papers. The company's statement came in a status report submitted Wednesday to U.S. District Court Judge Edward Chen in the Northern District of California, who is presiding over a lawsuit filed against the company by the FTC. That dispute started over the telecom's "unlimited" data plan, but escalated into a battle over something much bigger -- the FTC's ability to police Internet service providers. AT&T responded by arguing that the lawsuit should be dismissed on the grounds that the FTC lacks authority over common carriers. Mobile broadband wasn't considered a common carrier service when the FTC filed suit, but AT&T argued that was irrelevant due to the company's longstanding role providing telephone service. Chen sided with the FTC, but a three-judge panel of the 9th Circuit agreed with AT&T and ruled that the FTC couldn't prosecute the company. That decision stunned many industry observers, who said it effectively stripped the FTC of the ability to police a host of activity by broadband providers -- including their net neutrality and privacy practices. The FTC then appealed to a larger, 11-judge panel of the 9th Circuit. Those judges unanimously ruled that the FTC may proceed with its case against AT&T, because the FTC's charges center on a non-common carrier service. AT&T said in early May that it planned to appeal to the Supreme Court. Had AT&T won at the Supreme Court, the FTC may have been foreclosed from bringing any enforcement actions against internet service providers. It's not clear why the company decided not to pursue that appeal. An AT&T spokesperson said only, "We have decided not to seek review by the Supreme Court, to focus instead on negotiating a fair resolution of the case with the Federal Trade Commission." Regardless of AT&T's reason, its new decision leaves the FTC free to continue to prosecute broadband providers that dupe consumers. Mary Meeker, a partner at Kleiner Perkins Caufield & Byers, gave her annual Internet Trends report presentation at Recode's Code Conference yesterday, revealing more declines in print ad spending. The presentation, which had nearly 300 slides, curates data on what Meeker believes are the biggest trends in Internet usage and growth. One part of her presentation compares time spent on media in the U.S. with ad spending. The categories of media are print, radio, TV, desktop and mobile. This year, print received 4% of time spent on media (slide 96) and 9% of ad dollars, according to Nieman Lab. Print has been steady at 4% of media consumption since 2012. Ad spend was different for the print industry in 2011. That year, Meeker’s presentation showed print received 7% of media consumption, but a whopping 25% of ad spend. Radio stayed steady at 13% of time spent in media in the U.S., while TV and desktop dropped to 36% and 18%, respectively. The future, Meeker suggests, is mobile. A chart in one slide of the presentation showed about a “$7 billion opportunity” in 2017 for mobile advertising spending, because ad spend lags behind time spent in media. Time spent on mobile increased to 29% of the pie in 2017, according to the chart. Total news-consuming sessions on mobile in the U.S. increased by 20% from 2016 to 2017. People are spending more time online, according to Meeker's presentation. U.S. adults spent 5.9 hours per day on digital media in 2017, up from 5.6 hours the year before. About 3.3 of those hours were spent on mobile. Today’s brands are competing against a new paradigm of conscious consumers and tech-enabled players, but they’ve been resorting to “cheap tricks” and illusive tactics to gain an edge. Does a limited-season line of eco-friendly clothes counteract years of wasteful production? Will an updated Terms of Service page help restore consumer trust in the wake of data-collection controversies? Unfortunately, these altruistic initiatives act as little more than temporary Band-Aids. At most, they elevate a brand to top-of-mind for their audiences—but the inevitable disruptor is often just around the corner, with a startup edge, transparent processes and consumer-centric approach, seamlessly gaining customers’ interest and trust through purpose-led brand experiences. 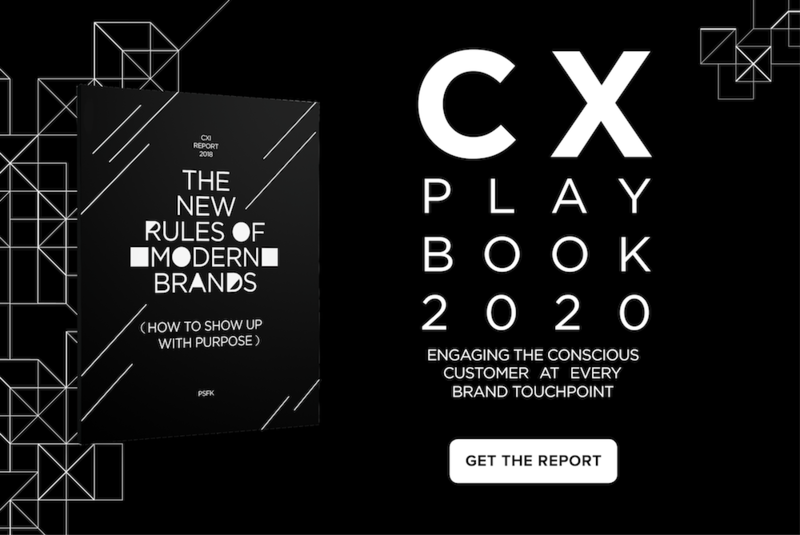 The CX Playbook 2020 by PSFK (available as part of PSFK Premium Membership) lays the groundwork for any brand looking to effectively build purpose-driven campaigns, products and brand experiences that will sustain consumer interest and gain long-term loyalty. Based on PSFK’s robust trends-analysis across consumer-focused industries, the CX Playbook 2020 will guide retailers to success through three actionable steps, supported by nine trends-based initiatives, along with implementation strategies, consumer insights and best-in-class case studies. It’s no wonder marketers’ heads are spinning. Today’s always-connected and increasingly empowered consumers place elevated expectations on every interaction they have with a brand, whether online, in-store, or on their mobile device. These heightened expectations are forcing marketers to re-evaluate their strategies, so they can deliver relevant and personalized experiences to each individual. One way in which marketers are tackling this issue is by restructuring their internal teams. Traditionally, marketing departments have consisted of a team of generalists who know a little bit about various marketing techniques, such as paid search, email marketing, and social media marketing. However, it’s next to impossible for generalist marketers to be experts in all areas of the consumer journey. For this reason, brands are starting to staff their teams with marketing specialists — trained marketers who understand how and where consumers engage with their brand and can identify opportunities to optimize the value each interaction. This enables the specialists to create more engaging experiences that forge deeper, more authentic relationships with their customers and prospects. As any marketer knows, understanding the target audience is key to success. 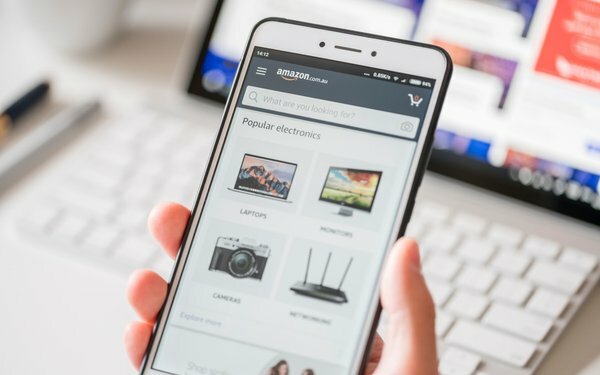 If marketers can’t get an accurate and holistic view of consumers as they traverse across multiple channels, devices and touchpoints, then they can’t accurately measure the value of each interaction or how well they’re moving them towards on online conversion, in-store visit, repeat purchase or other desired outcome. By aligning along the consumer journey, marketing specialists will gain deeper insight into who their prospects and customers are, what they like, and how they behave, so they can deliver more relevant content, messages, and offers that drive action. Specialists may manage different parts of the funnel or be responsible for inbound or outbound marketing — there’s no right or wrong way to organize the team. The right structure will depend on what works best for the brand and what will deliver optimal results. Marketing specialists must have many of the skills that generalists have today, but also need to stay on top of the newest trends and techniques. In the past, most companies had small in-house marketing teams with bigger budgets, and they outsourced their advertising to agencies with cutting-edge technologies and approaches. Now, marketing teams are bigger but have smaller budgets to work with. Instead of outsourcing to agencies, teams are leveraging a number of technologies to accomplish more on their own. When the data that these systems produce is collected, consolidated, and normalized in a single, centralized repository, marketing specialists can work together towards shared goals, while harvesting the real-time insights they need to respond to changes in consumer behavior and quickly capitalize on optimization opportunities. One challenge brands may face is finding and hiring marketing specialists with the right skill sets and knowledge. Marketing is like a fine symphony orchestra — many different instruments must work together in order to create beautiful harmonies. To create a symphony, marketing leaders (the conductors) must be able to put the right performers together who have their own specific areas of responsibility yet work perfectly in sync. Consumers will only continue to demand more meaningful experiences with brands, so it’s up to marketers to adapt to these needs. By shifting from a marketing generalist to a marketing specialist model, brands will be able to provide more relevant and engaging experiences for consumers that forge stronger relationships and lasting loyalty. Many U.S. marketers’ Hispanic marketing strategies traditionally target Spanish-speaking customers around Hispanic events, like Cinco de Mayo or Quinceñeras—and little else. But as many companies have started to realize, this approach is inauthentic and not an effective way to successfully engage consumers who are part of an increasingly important and powerful market. The U.S. Hispanic market is actually comprised of many groups that have myriad interests, traditions and backgrounds. Put together, this demographic has tremendous buying power in the U.S. economy. Despite this, many B2B and B2C companies haven’t done much to attract Hispanic customers and garner their loyalty. The main reason is a lack of cultural understanding. Cinco de Mayo, for example, gets a lot of attention from Americans, but it isn’t celebrated by most native Mexicans. When companies don’t do their research, the results of their U.S. Hispanic outreach are lackluster. But it doesn’t have to be this way. The brands that most successfully market to U.S. Hispanics localize their ads and strategies, but treat their Hispanic customers equal to their other customers, which builds trust and brand loyalty. This philosophy extends to the digital experience, as well. These companies create a robust Spanish-language customer experience equal to their English-language versions. And it doesn’t stop there — they also produce translated marketing material to reach more Spanish-speaking customers. Smartphone use for U.S. Hispanics is higher than the market average. Companies would do well to invest in mobile strategies for both Spanish- and English-speaking markets, which need to be as exciting, interactive and informative as their other channels to attract these mobile-centric customers. Family, culture and heritage are important to U.S. Hispanics. They keep in contact with friends and relatives in their home countries, and honor cultural traditions. Companies can highlight these values in their advertising strategies to resonate with their audience. Instead of targeting the U.S. Hispanic market with a separate strategy, companies should unify their marketing plans. An integrated strategy shows that Spanish-language customers are just as important as the rest of the U.S. market. Translating content into Spanish is a good first step, but it’s not enough for companies to succeed in reaching the U.S. Hispanic market. Brands that want to engage U.S. Hispanic consumers will need marketing strategies that give them equal attention and reflect their cultural values. Understanding Hispanic culture, family life, and heritage is important to connecting with this influential and ever-growing demographic. Venture capitalist Mary Meeker at Kleiner Perkins released her annual Internet Trends 2018 report this week, covering everything from mobile to commerce. The biggest trends influencing search marketers are the flat smartphone shipment rates and slowing internet growth rates. The good news is that U.S. adults are spending more time online, up to about 5.9 hours per day in 2017, compared with 5.6 hours in 2016. About 3.3 hours of the total amount of hours are spend on mobile, compared with 2.1 hours spend on desktops and laptops. About 0.6 hours are spent on other connected devices. As Google Search and Microsoft Bing data suggests, people are shifting their time to mobile. 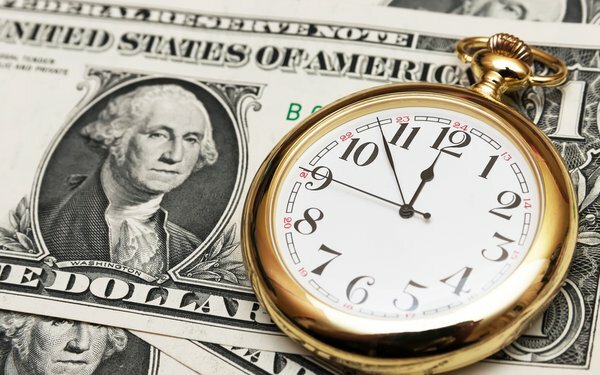 Meeker’s report suggests that ad dollars are not following as fast. She pegs it as a $7 billion mobile ad opportunity. Increased access to WiFi networks and voice are two trends that are also increasing the use of the internet. Living in a rural Wyoming community, I would have needed to change cellular carriers if not for WiFi in my home. AT&T doesn’t have enough cell towers in the area. Google is becoming more like an ecommerce company, moving from an ad platform to a commerce platform. Amazon is repositioning from a commerce platform to an ad platform and a search company, according to Meeker. She also confirmed that more people begin product searches on Amazon than search engines. 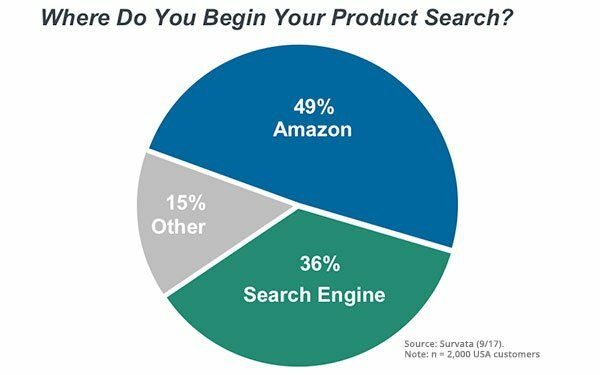 In fact, 49% begin their search on Amazon and 36% on search engines, and 15% find another place to start a search. Amazon founder Jeff Bezos, however, still relies on other media like Facebook to inspire people to want to buy. The share of social media ecommerce referrals rose 6% in 2017, compared with 2% in 2015. Voice technology is at an inflection point due to speech recognition, specifically Google -- reaching 95% accuracy and the sales of Amazon Echo devices that reached more than 30 million units sold by the end of 2017, up from 10 million units in the first quarter of the same year. The number of Amazon Echo Skills also rose from 10,000 in early 2017 to 30,000 now. 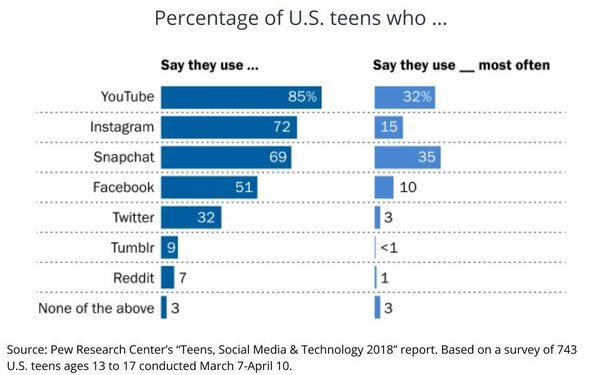 Facebook may position itself as “the” social network, but when it comes to America’s teens, it has become a distant also-ran to YouTube, Instagram and Snapchat. Only half of teens ages 13-17 say they even use Facebook, while only one in ten characterize it as the social media platform they use “most often,” according to new research being released by the Pew Research Center this morning. 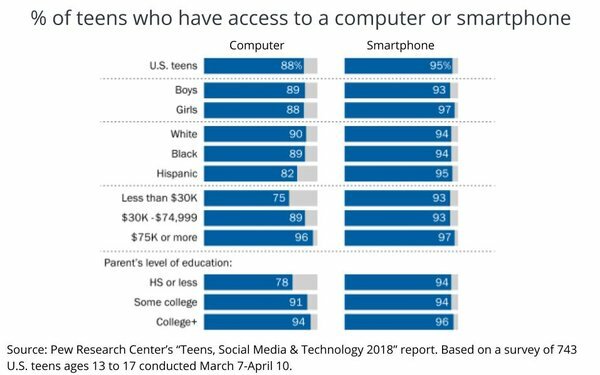 Pew attributes at least part of the shift from Facebook to a corresponding shift in the “technology landscape for young people,” especially their ubiquitous access to smartphones, and their incessant connection to them: 95% of teens new report having a smartphone or access to one. The study also probes the effect social media is having on America’s youth, and finds nearly a third (31%) see it as mostly positive, while nearly a quarter (24%) see it as mostly negative. Amid all the loud noise emanating from digital advertising about technology, rebates, viewability and transparency, it can be easy to forget a very simple truth. Half of all UK digital advertising goes on search, according to the IAB UK. It only gets the occasional headline, but it is actually the biggest channel. So it was interesting to see Warc suggest this morning that search is going from strength to strength, often at the cost of display formats. The overall macro figure is startling. Search's share of global advertising spend has trebled over the past decade, and, this year it is expected to reach 22% in the US, 26% in China and 30% in the UK. Forget the world "digital" for a moment. That means that nearly one in three advertising pounds spend in the UK this year will go to paid search. As an extra insight, globally, mobile averages out at just under two-thirds of search budgets. This represents a doubling, globally, since 2015 alone. So, to do a little number crunching, if 30% of all advertising budgets go to search, that means nearly 20% of every pound spent on advertising in the UK is headed the way of mobile search. Pretty impressive. Obviously, Google stands to be the main beneficiary, because -- although its global dominance accounts for around two-thirds of the search market -- in the UK it's pretty much the only game in town, accounting for more than four-fifths of the market. Warc is pretty clear about where this growth is coming from -- display. Search is eating into display budget, its researchers claim -- and image search and voice search are continuing this trend. interestingly, its global average figures suggest that the search click-through rate is around 3.3% -- just over six times better than display, and at just over 4%, conversion rates are four times higher for search than display. However, cost per click is also around four times higher with search campaigns compared to display. It's an interesting way of looking at the market. Conversions are click-throughs are much better on search than display, but at the same time, the cost goes up too. if this tells us one thing about global marketers, right now, I'd suggest it shows that they are looking to back more of what gamblers would call a "sure thing." Yes, the cost of search is high, particularly for lucrative keyword terms -- but then so too is response because, by the nature of the channel, people have usually shown they are potentially in-market for a product or service. Digital marketers are obviously taking out their calculators and making the decision that the higher cost is worth it because it leads to improved results. Plus, with search marketing, you know you have been seen because you are only paying for click-throughs. Sure, it's not perfect -- but it has to be a lot more reliable than hoping ad units are seen rather than hidden away below the fold. So, search is going nowhere. It may be the old stalwart and it may not be what trendy execs discuss at major conferences, but it's the biggest digital channel there is and, if you listen to Warc, it's growing globally and that growth is coming at the expense of display. Video ad tech company SeaChange International is rolling out a suite of tools designed to help traditional video providers, over-the-top video providers and other direct-to-consumer video providers deliver personalized videos and video advertising to consumers. As consumers increasingly watch their content on a mix of mobile devices, connected TV devices and set-top boxes, consistency of experience has become an issue. At the same time, data from these viewing sessions allow for more personalized content and ads. 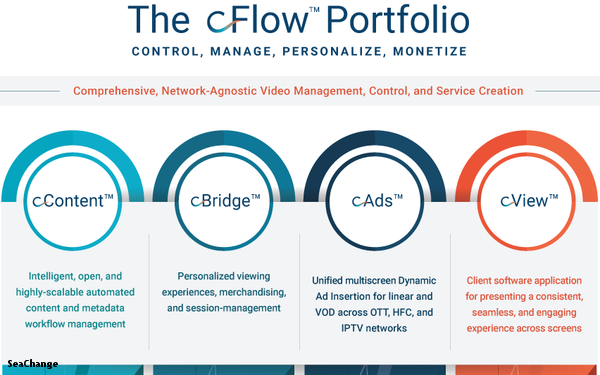 The solutions portfolio, which the company is calling cFlow, is comprised of four tools, which can be used together or individually. cContent is a content management tool designed to simplify content workflows. cBridge provides scalable capabilities like offer creation, pricing, packaging, promotion and multiscreen session management. cAds, an advertising management solution, delivers “targeted, personalized advertising across multiple channels and devices,” while cView is a viewer experience solution offering a consistent look and feel across OTT, mobile and set-top-box devices.